Relaxing and people watching is an enjoyable event shared by many in public spaces. Outdoor bollard lighting can make it a safe and comfortable space for all to enjoy even at night. An outdoor space must be inviting during the day and at night if people are going to spend time there. What better way to do that with bollard lighting. What exactly is bollard lighting? It essentially is a heavy duty post light, sometimes used as a barrier that prevents cars from entering into a certain outdoor space. Often, they aren't used as barriers at all but as a convenient way of providing commercial outdoor lighting for open spaces. Supplementing your current lighting design with outdoor bollard lighting can really make a difference. Find out how to effectively blend them into the existing outdoor lighting fixtures your currently using. Move people along by guilding them to where you want them to go. People are naturally drawn towards light and bollard lighting can be just what is needed to lead your traffic to where you want it to flow. It can be used to help separate one section of an outdoor space from another. It almost creates an imaginary barrier or wall that tells people where they are permitted to go. 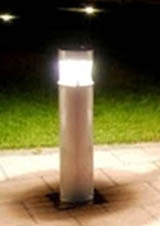 Bollard lighting is an excellent source of outdoor security lighting because of it's low stature. You can use it to guide people along a certain path towards an entrance or exit. Its a perfect supplement to your current lighting design. Rather than having many expensive outdoor post lights installed, outdoor bollard lights can be used as an intermediary between these posts. Incorporate bollard lighting into your commercial landscape any way you know how by matching them up with your current lighting design. It must be sturdy and durable. Your bollard must be constructed with a strong housing. Installation by a professional may be necessary to keep the fixture from being compromised by rough use. It must be resistant to corrosion. Bollard lighting is going to be in direct contact with whatever nature throws at it so it must be able to withstand the abuse. It must be tamper proof. A tamper proof bollard light will help to deter any unwanted theft from taking place. Special hardware should be used in installation as a preventative measure. Your bollard lighting must provide adequate lighting. It should be able to produce enough light for it's surrounding area so that your guests can see beyond the immediate path. It makes people feel a sense of safety and security. It must contain an impact resistant lens. An impact resistant lens will prevent vandalism or theft of expensive HID bulbs. Since bollard lighting is in direct contact with the general public, it must stand up to the demands of it's environment. Incorporating bollard lighting in your commercial space can make it easier to get around. Return to Commercial Outdoor Lighting.